Ellie’s Table is a celebration of Eleanor Mastroianni, who’s cooking and baking skills helped turn Jay’s Catering into a true catering dynasty. As a husband and wife team, Jay + Eleanor Mastroianni began a small catering business out of their home in 1967. Today, the company is considered one of Orange County’s best caterers. Ellie’s Table completes a circle of food industry experience, beginning with Eleanor’s first job at Conway’s Corner—a small diner in Rochester, P.A.—and culminating in this café. Even though she was a trained nurse, Eleanor took her first steps toward a career in food service at Conway’s, which is also where she met her future husband, Jay. After marrying in 1953, Jay’s mother taught Eleanor how to prepare classic Italian Mastroianni family recipes. Decades later, Ellie’s Table has opened in homage to this matriarch’s incredible culinary talents. Our café offers up some of her most famous dishes, like Ellie’s Potato Salad + Ellie’s Famous Cinnamon Rolls. While our cuisine is lovingly rooted in family tradition, our chefs also relish in producing innovative takes on Eleanor’s classics. Their recipes are both imaginative + true to the essence of Ellie’s cooking; an essence that is perfectly encompassed in our slogan: “Happiness is Homemade”. While all of our cuisine is tantalizing, locals have come to associate Ellie’s with our incomparable bakery—and especially our Butter Croissant, Ellie’s house specialty. The buzz around our bakery stems directly from our French pâtissier’s love of the innovative, and his passion for the timeless. Chef Christophe bakes every morning and our menu reflects his daily inspiration. All of his creations are out of this world and range from down-home favorites to twists on well-known classics and originally-incepted treats. Our menu is designed with a remembrance for some of our founders’ favorite dishes, like Jay’s Famous Cheese Roll Palm Sandwiches and Ellie’s Potato Salad. Our chefs are dedicated to creating sumptuous, aromatic food that resonates with every palate while still pushing the borders of typical café cuisine. From Flat Iron Steaks to Quinoa Wraps, our menu consists of dishes that appeal to a wide range of appetites. All of our food is made fresh and from scratch on the day that it is ordered. We use sustainable ingredients whenever possible and consider delivering simple, clean foods with bold flavors to be our motto and mission. We’re also happy to accommodate special dietary needs whenever possible, and offer a wide variety of Gluten-Free, Vegan, Vegetarian, and Heart Healthy items. 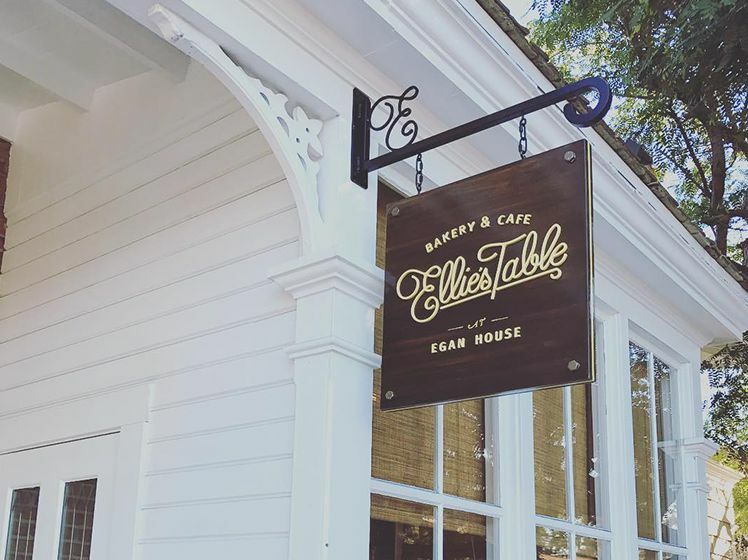 Ellie’s has become a local hotspot within the San Juan Capastrano community, where residents and tourists alike enjoy delicious food and drink in a welcoming, beautiful environment. Our passionate baristas use freshly-roasted and environmentally-conscious Kean coffee beans to hand-craft every drink. Besides providing a full espresso bar, we offer delicious teas, tea lattes, and hand-picked bottled beverages from all over the world. Our cuisine is artisan-crafted as well. Whether you are in the mood for a freshly-baked pastry in the morning or a cup of homemade soup in the afternoon, our food is diverse and pairs perfectly with our refreshing beverages. We are also the premier local caterer. Since we are an extension of Jay’s Catering, which has been one of Orange County’s leading catering companies for decades, we have the experience required to professionally cater your next event, regardless of its size. Feel free to choose items that we serve here at Ellie’s Table, or take a look at Jay’s website for more extensive menu options.